The Memorial Candle Program has been designed to help offset the costs associated with the hosting this Tribute Website in perpetuity. Through the lighting of a memorial candle, your thoughtful gesture will be recorded in the Book of Memories and the proceeds will go directly towards helping ensure that the family and friends of Gloria Gnandt can continue to memorialize, re-visit, interact with each other and enhance this tribute for future generations. Gloria Mary Gnandt nee Tesauro, age 89, of Ewing entered into God’s eternal rest on Tuesday, March 27, 2018 at Capital Health System at Fuld in Trenton, NJ. Gloria was born September 12, 1928 in Trenton. She was a devoted and loving wife and mother. Gloria loved to prepare Italian dinners for her family and especially loved baking and putting out a beautiful spread of homemade pastries and food for the holidays. She was extremely social and loved to talk. Gloria was an animal lover who loved traveling and especially enjoyed taking trips to Atlantic City and the beach. She was a former member of the Rosary Altar Society of Incarnation Church and a longtime parishioner. 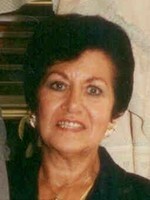 Daughter of the late Francesco and Carmela (Cifelli) Tesauro; beloved wife of the late Louis N. Gnandt; sister of the late Joseph Tesauro, Mary Cullaro and Dominic “Danny” Tesauro; she leaves behind to mourn her loss, her three loving children, Donna Marie Gnandt, Louis Gnandt and his companion Diane Davis and Bruce Gnandt and wife Carol; two sisters, Anne Patrone and Catherine Niwore; as well as many nieces, nephews and friends.